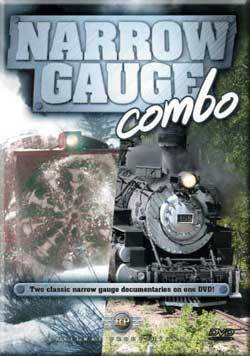 Narrow Gauge Combo contains two classic programs about railroading on the former Denver & Rio Grande Western narrow gauge lines in Colorado and New Mexico. "Narrow Rails Still Shine" is a documentary about both the Durango & Silverton as well as the Cumbres & Toltec. These incredible steam tourist railroads are all that is left of the once extensive narrow gauge system. In addition to seeing the current railroads, you'll meet several historians and retired railroaders who recount what the old times on the railroad were like. A classic look at the narrow gauge. Many people tell us that this is their all-time favorite train video. From Railway Productions. Approx. 1 hour . "Rotary Snowplow Through the Rockies" is an in-depth documentary about the ultimate in railroad snow fighting, the rotary snowplow. You'll see Rotary "OY" from both trackside as well as on-board the snowplow. Get a tour of how it works and see the insides in motion. In addition, you'll meet several retired railroaders who will tell you the tales of how brutal it was plowing snow when the narrow gauge ran year 'round. From Railway Productions. Approx. 1 hour. Narrow gauge railroading was once a small part of this great industry. And Colorado/New Mexico was indeed a part of it. In places like Newfoundland Canada, it is long gone, but it survives in broken pieces for tourists. In places like Durango Colorado and Chama New Mexico, it has survived. In this interesting video, we are treated to narrow gauge operations in these areas. Part # 1 of this combo shows us the trains of both the Durango & Silverton, and the Cumbres & Toltec. It is a documentary, so we learn some of the history, and see much of the operations in some of the most scenic regions of the USA. Part # 2 takes us to the snow of the end of April. The Cumbres & Toltec massive rotary snowplows. See the inside story as to how these massive machines of power operate and meet the men behind the scenes. It is a fantastic story as we see power verses Mother Nature. The only thing I would say is that the image quality could have been a bit better at times, and more time for the Durango and Silverton Railroad would have been nice. Over all, a good presentation. Recommended, espesically for the narrow gauge lovers. steamboy (revere massachusetts) on 2012-01-08 18:23:05. It was originally released on video tape in 1994 as "marathon of steam vol 1" but it is what it is.